Be determined to purposefully live out the day-to-day in a way that positively affects your years to come, that encourages you toward the finish line united. “How would you like to spend the rest of your life eating breakfast across the table from me?” the man asked boldly. The petite, dark-haired woman his words were directed at giggled. Perhaps her cheeks even blushed at such forwardness. “Big flirt!” she thought, secretly reveling in his attention. Yep, it turns out that my husband Ted isn’t the only guy I know who’s unafraid to utter the “M” word on a kinda-first date. Grandpa was all over that fifty years earlier. In both cases, the direct approach paid off. Grandpa and Grandma weren’t dating prior to that breakfast line. Sure, they casually knew each other. They’d even chatted before. But that forwardness of his brought with it a new chapter to their relationship. And fortunately for Grandpa, Grandma had come to college with the intention of majoring in the pursuit of a husband. The trip to the chapel wasn’t without its speed bumps though. The Bible college my grandparents attended didn’t allow students to get married and remain in school unless they were seniors. Well, except when special permission was granted. Grandpa, the freshman, decided to ask for just that. The dean denied his request. To which Grandpa replied, “Well, I figured that’s what you’d say, but we’re going to get married anyway.” And they did. I’d say such a legacy of relationship is worth celebrating, wouldn’t you? After all, marriage isn’t easy. I know it wasn’t always for them. Their decades together weren’t without struggles. They weren’t sans fights and hard seasons and opportunities to call it quits. But my grandparents determined that finishing the race as a team, with stories of God’s faithfulness through the hard times, was well worth the blood, sweat, and tears. Yep, marriage requires hard work. Its takes perseverance and patience. It means teamwork and a “never give up” attitude. Like these couples before us, Ted and I try to bring these qualities to our marriage. We want to finish well too. Someday we want our kids and grandkids to look back and remember how we honored those sacred words “I do” and “I promise” and “I will” that we vowed before friends, family, and, most importantly, God. We want our story to point others to Christ’s dramatic story of steadfast commitment to us. Here’s the thing I’m finding. Yes, finishing well comes with the culmination of years and decades. There’s no doubt about that. However, those monumental anniversary celebrations aren’t what ultimately determine the actual direction of our marriage. Rather, it’s the here and now. It’s those daily decisions Ted and I make individually and together that influence how our relationship actually fares in the long run. The keys to our longevity are found in those moments we decide to assume the best of each other instead of the worst. In those times we choose forgiveness rather than bitterness. On those days we offer grace, not irritation. How well we do is influenced largely by the seemingly small, blink-of-an-eye choices. 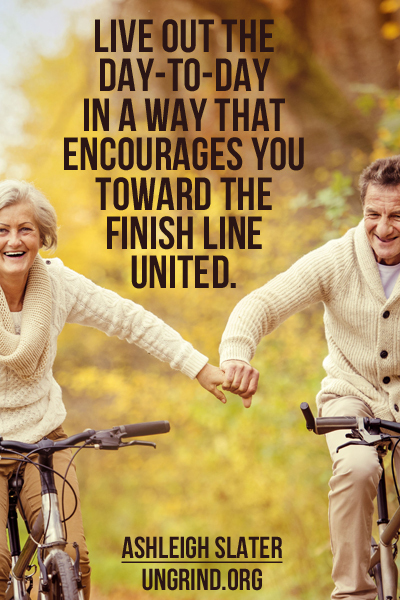 Because of this, Ted and I are determined to purposefully live out the day-to-day in a way that positively affects our years to come, that encourages us toward the finish line united. Sometimes I like to imagine Ted and myself decades from now. Maybe even fifty-two years from the time we said “I do, of course.” We’ll be holding hands and strolling the streets of San Francisco or Paris. Old in body, yet as Michael Bublé croons, young in heart. Ted, he’ll still have the spiky, musician-crazed hair I met him with, but in platinum silver. Although if he’s lost it, that’s okay. With that mischievous charm of his, I’m certain he can make the no-hair thing work too. Me, I’ll prove that “mature” women don’t have to shed their long locks. Ever. For those passersby who take the time to look past the surface of this spunky elderly man with the dry humor and the old lady who can still talk a mile a minute, I hope they see more. More than orthopedic shoes and world-worn bodies who long for the vitality of heaven. I’ll look back over that path we traveled as a team, the one marked by grace and Hunger Games campaigns and lost seasons. As I do, my heart will well with joy as I gaze at this man who loved me and walked with me and extended me kindness so well. And I hope he sees the same when he turns his gaze toward me. When he looks at his teammate for life. How about you? Fifty years down the road, what will your years have been marked by? I hope you too will look back and smile at the “Team Us” you’ve created. That just like Ted and me, your story will be one of marriage together. 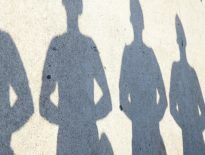 Articles	What Does It Mean to Be Authentic?